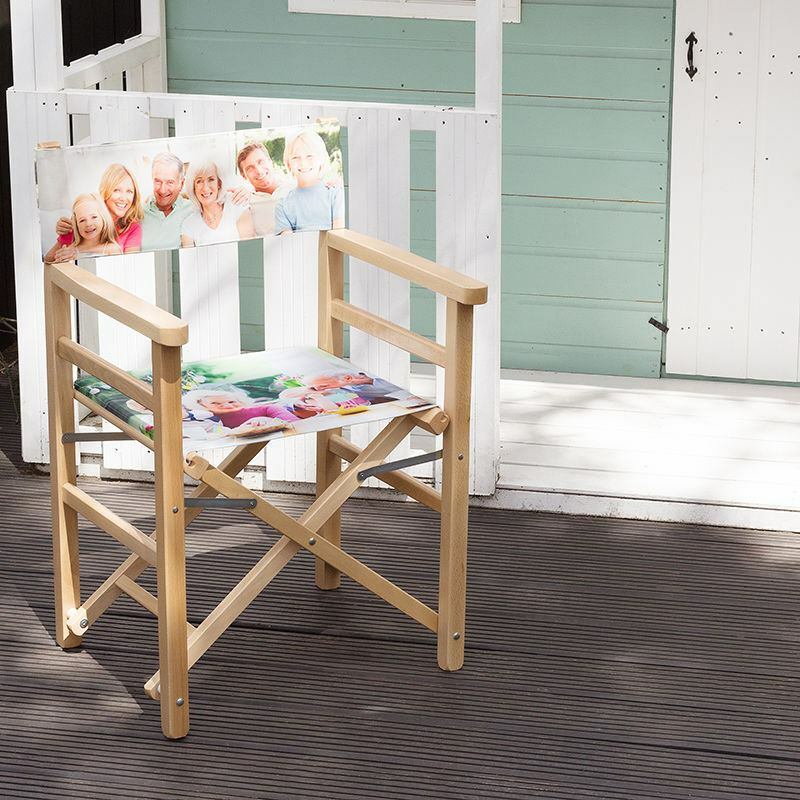 Beautifully handmade using canvas and responsibly sourced beech wood, our personalised director's chairs look stunning printed with your photos, text or art. A simple but classic design, the director's chair is fully collapsible, ideal for picnics, the beach, festivals or kept in your garden for al fresco dining. Made from responsibly sourced sustainable wood and durable canvas, your director's chair is an elegant piece of furniture for your garden. Custom printed with your photos or designs on the seat and backrest - front and back - you can create a truly bespoke chair for yourself or a loved one. The hardwood frame is made in the EU from responsibly sourced beech wood. The custom canvas printed with your designs is handmade here in London, UK. Printed, cut and sewn by hand, we ensure your chair is of the highest standards. Gift was for someone very difficult to buy for. Bags of Love were very helpful with designing and we were very happy with the results. Like many of our products, these personalised chairs come with a quantity discount, so buy a set for the garden table and save money today. The frame for your custom director chair is made by hand by our expert craftsmen. Your design is printed onto the removable backrest and seat using up to date printing techniques which permanently bond the ink deep into the fibres of the material. Care: The seat and backrest are detachable so you can machine wash at 30°c. Tumble dry safe, iron on low heat. If leaving your wooden director chairs in the garden all summer, your print might fade so cover them when out of use to maintain the quality of the print. The three printable areas are the seat, and the front and rear of the backrest, making it reversible. Print a message on one side of the backrest to indicate who the chair belongs to, and the other side with a cool design or photos. The seat area is square but the backrest is landscape in orientation, so choose photos that are wide, not long. As a funny present to your colleague friend or boss, create a funny personalised director's chair printed with 'The Boss', or 'Do Not Disturb' if they're a grumpy sort. In meetings, they can have their very own reserved seat which nobody else can use. For outdoor weddings on a beach, hilltop or garden, create personalised directors chairs for the bride and groom to sit on after the ceremony has finished. With a beautiful font and monochrome photos, these will look so elegant. Print your company's logo onto a director's chair when you're exhibiting at a corporate event. You'll not only attract visitors to the stand, but it's an effective way to widen the reach of your brand. Summer holidays come and go too fast, but you can relive them on your bespoke wooden chairs. Print a photo collage using your best snaps from different countries to make lovely garden seats. As you're dining al fresco in the summer, you can reminisce about your travels. Mad for movies, or have a loved one who is? Make their Hollywood dream come true and let them (pretend to) be the top film director. Print movie scenes, famous lines and characters to ignite their cinematic passion.